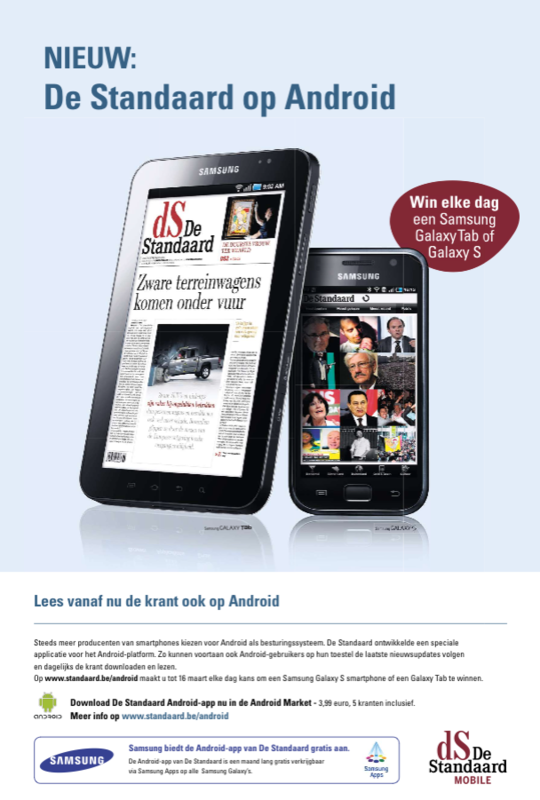 After the ‘Komen Eten’ app we are launching a second app this week: De Standaard on Android. In 2009, De Standaard was the first Flemish newspaper with an iPhone app. One year later, they were also the first with an iPad app. Both apps developed by MobileWeb counted for 23.000 paid downloads. The Android version is based on the iPhone app and adapts itself to the many different Android mobile phones and tablets. The app is available for 3,99€. In this package, five newspapers are included for free. Next to the newspaper content, the online news is just a few clicks away. These articles can be shared easily via Twitter, Facebook or mail. Also subscriptions are integrated: 15€ for a month and 159€ for a full year. Single copy sales are not possible yet due to limitations in the Android Market. Related to this launch Samsung offers a special promotion. If you have a Samsung phone or tablet you can download the app for free in the Samsung store from march 11th until april 11th. Click here to download from the Android Market. iPad app ‘Second Screen-Come Dine With Me’ (Tweede Scherm – Komen Eten) on nr 1 in the Belgian Appstore. 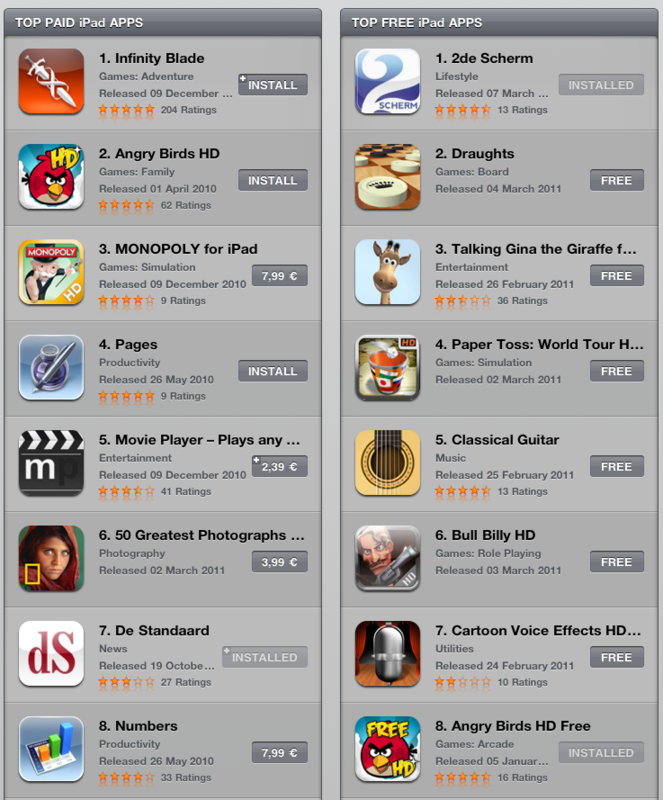 On its release day yesterday, 7th March, the iPad app reached already the first place in the Belgian Appstore. The app is free available for download. As such, a lot of users were curious to do so. In addition, the app received a lot of positive comments which resulted in an excellent score of 4.5/5. Yesterday was also the first real test case, since the new season of ‘Komen Eten’ headed off. Some press comments can be read below. Note: we are also pleased to see that the paid iPad app ‘DeStandaard’ is a real ‘top 10 – stayer’. Thanks to all the readers! 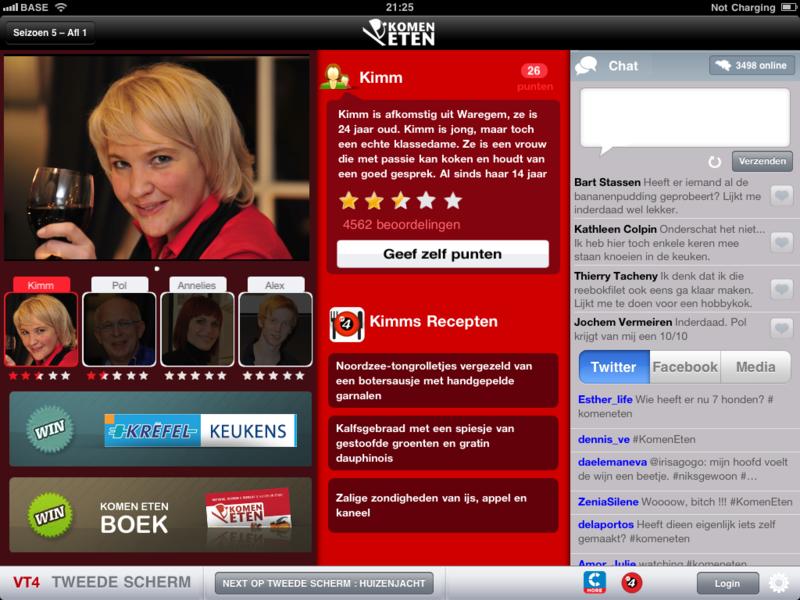 Comments Off on iPad app ‘Second Screen-Come Dine With Me’ (Tweede Scherm – Komen Eten) on nr 1 in the Belgian Appstore. 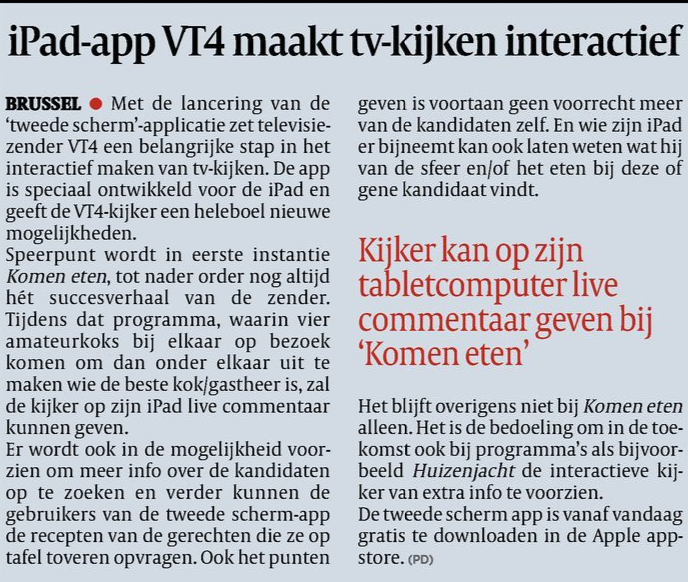 MobileWeb launches iPad app ‘Second Screen – Come Dine With Me’ (Tweede Scherm – Komen Eten) for SBS Belgium. 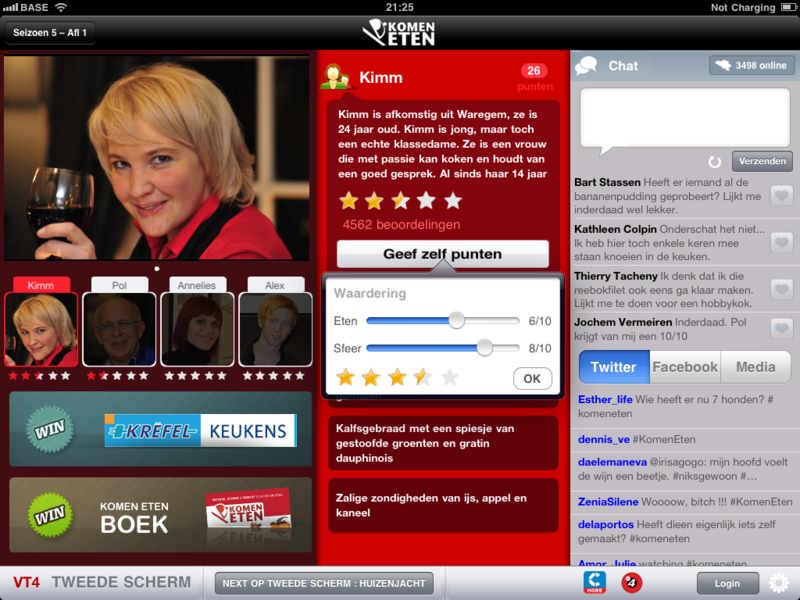 MobileWeb is proud to announce the launch of the iPad app of Tweede Scherm – Komen Eten (‘Come Dine With Me’ international TV format). The Second Screen social TV iPad app offers viewers an interactive experience while watching television. First, it gives the viewer additional background information, such as pictures, bios, related articles. Secondly, they can participate to the show: they can rate other candidates with regards to food and atmosphere. Finally and one of the key elements of this innovative iPad app is the interactivity component: viewers are able to comment and chat with each other on what they see, feel and hear. At the same time the Twitter and Facebook conversations are integrated as well. ‘Komen Eten’ is the first format on ‘Tweede Scherm’, other formats and platforms will follow. This ‘social TV’ application is the first in its kind in Belgium, if not in Europe. Last year ABC was one of the first TV broadcasters who started experimenting with second screen applications. Also other American programs and TV stations followed. However, in Europe the trend hasn’t broke through (yet), although experts expect the next few months to be the turning point for Social TV. David Rowan, the Editor of Wired magazine has named Social TV at number three of six in his peek into 2011 and what tech trends to expect to get traction. TV is inherently social – and Social Media is a conduit. Put them together in a workable, ergonomic way and the convergence will have impact. This innovative application has been developed in a couple of weeks time. The development cycle has been short as the application was developed on the MobileWeb Mobile Publishing platform. This platform offers media companies and publishers a fast track to get their content on a variety of mobile devices (smartphones and tablets). If you wish to receive more information about our Mobile Publishing Platform and services, please send a mail to contact@mobileweb.be. 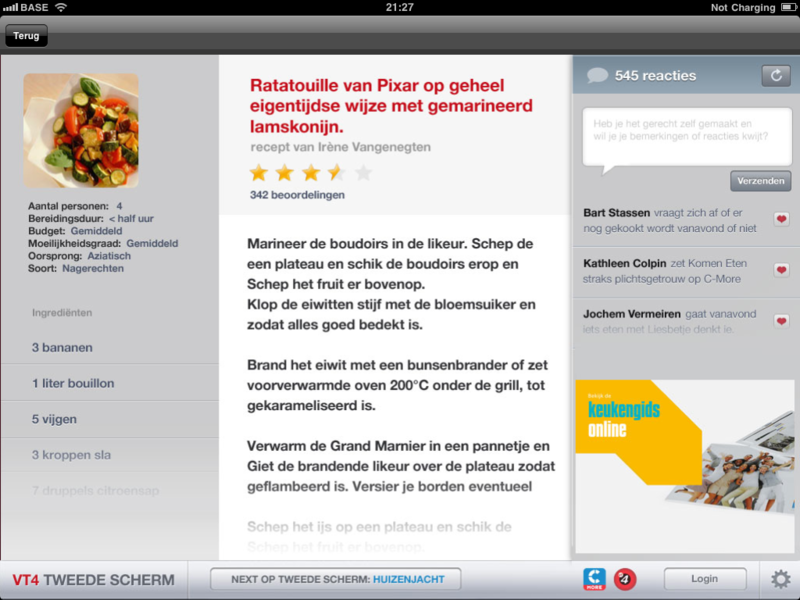 Comments Off on MobileWeb launches iPad app ‘Second Screen – Come Dine With Me’ (Tweede Scherm – Komen Eten) for SBS Belgium.